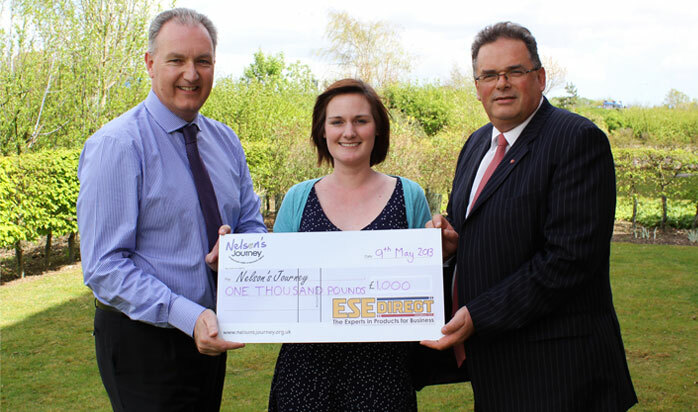 NORWICH based charity Nelson's Journey is to receive a £1,000 boost to its funds, thanks to one firm’s online charity day. Award winning Industrial Supplies company ESE Direct, which is based in Norwich and is an Archant Future50 company, pledged to donate at least 5% of their online sales on Friday 26th April to one charity chosen by its customers. Nelson’s Journey received an overwhelming number of votes in a poll open to ESE Direct website visitors, and will now be able to put the donation of £1,000 toward supporting young people throughout Norfolk. Three charities were listed on the ESE Direct website for a week leading up to the charity day, and visitors were asked to select which they thought should be given the money raised. The same process will be repeated again in June, and ESE Direct are looking for charities to contact them who think they deserve to be on the shortlist of three. Nelsons Journey was foundered in 1997 and is committed to supporting young children through the journey of bereavement, helping children to cope with the loss of a significant person in their life and find a way to continue on with their lives. In 2012, 404 children were referred to Nelsons Journey for bereavement support, 255 of these had there bereavement needs assessed and 113 received support on a 1:1 basis.